When it comes to adopting cats, the trouble usually isn’t unruly behavior or poor health. Most of the time, the biggest problem these felines have is that they need a home. You can fix that problem by adopting a kitten or cat from your local animal shelter. To ensure that you are making the right choice for you and your family, you need to do a bit of prep work. Kittens are adorable. Their high-energy playfulness means they’re fun to watch and even more fun to interact with. On the other hand, they can be a bit destructive and require more supervision. As kittens grow and develop, so too do their personalities — in fact, you won’t know exactly who this animal is for some time yet. Toddlers can unintentionally be a bit rough around a kitten. So, if you do get a kitten—or a cat—and if you have a small child in the house, it is important to supervise the two at all times. With an older cat, you can be more certain about the temperament. Typically, older cats are great with older children. And they’re generally much calmer than kittens (who tend to be small fur balls of high energy). Call your local shelter to ask questions before you visit, and check out the shelter’s online website. Most post photos and many add anecdotal information about their adoptable pets. New arrivals to the shelter may not be posted online, so it is important to tour the shelter to see all of the animals. In addition, it’s a good idea to talk to a shelter worker or volunteer beforehand. Tell him what type of pet you are looking for. You may already have a cat at home, and want another one that gets along with other cats. Or you may have children and need a kid-friendly pet. Often shelter workers know the history of the pets that are up for adoption. They can make recommendation based on your family and your preferences. For example, are you looking for a cat who gets along with dogs, kids, or other cats? Maybe you’d like an older cat, more suitable for a quiet home. Bring everyone in your household with you to the shelter. If you have small children, let them know before you visit that you are choosing one cat — not all of them. It can be hard on children (and adults) to not take everyone home. Carefully observe the cats and watch how they respond to you and your family. Some are shy. Others are quite playful. Some may be fearful. Others will come right up to you and your family. Like us, cats have different personalities. If you see one you are especially interested in, ask the shelter worker to take him out of his cage so you and your family can interact with him. 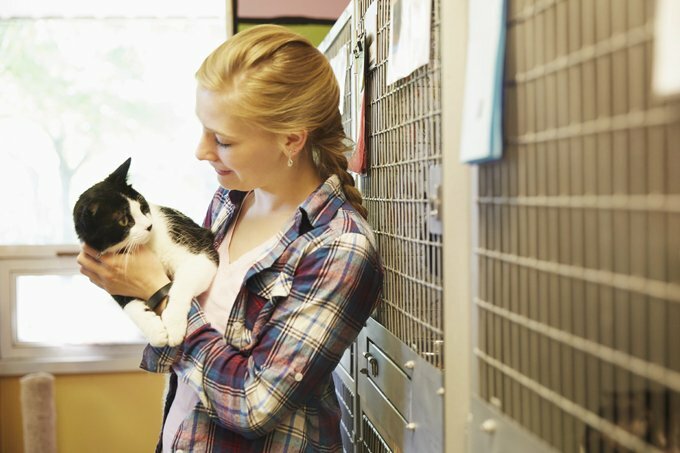 Most shelters have a space for you to get to know the cat. Remember that the cat might be afraid; after all, he doesn’t know you well. Talk to the cat in a soft voice; get down on the floor and let him come to you. Watch how he reacts when you gently reach out to pet him. Once you make your choice, you will have to fill out paperwork and pay a fee, which covers the cost of shots and spaying or neutering. Adult cats often cost less than kittens because the adults are usually spayed or neutered. Back home, make sure you set up a litter box and have a food bowl and water dish in a separate area away from the litter box. Give your cat some time to adjust to her new home and new family. You’ve chosen her, and in time, she’ll probably come to choose you as well.